#UCSCAlumni Commencement Special Feature: "I’m investigating induced pluripotent stem cells which allow us to create a variety of cell types, like heart and brain cells, from skin scrapings. For my thesis, I'm developing a device to measure the electrophysiological activity of these cells. Even after my Ph.D., I hope to remain in bioelectronics for the rest of my career. I’m really interested in teaching and academia and I’m hoping to eventually be a professor in the field." Henry Hinton (Merrill) is a bioengineering major at Jack Baskin School of Engineering at UC Santa Cruz. Hinton will be attending Harvard University for his electrical engineering Ph.D. this fall. 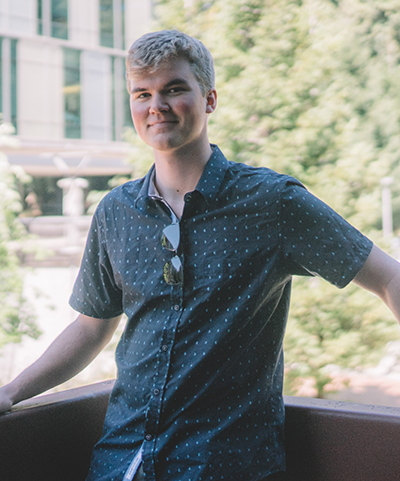 He credits UC Santa Cruz’s research opportunities and having close connections with his professors for preparing him for the work in his field. To celebrate commencement and Year of Alumni, we're presenting profiles of a graduating student from each division at UC Santa Cruz as part of our special #UCSCAlumni Commencement feature.